Cook the pasta as per their instructions. Heat the oil in a pan and add the garlic, tomato and beef. Stir. Let cook at medium heat for 15 minutes. Once the beef has cooked, mix in with the pasta. Add the shredded parmesan cheese. Many of us associate certain dishes with memories, myself included. They say meals are memories and I certainly agree with that. There are some dishes that transport me to different places and moments. 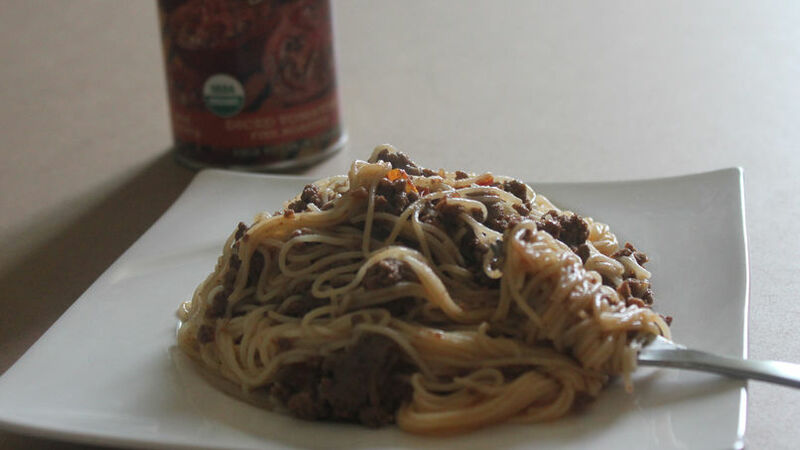 One of them is spaghetti with beef, a simple and delicious dish that both my mother and grandmother would prepare. Just thinking about this dish I'm reminded of the counter in Bogota where it was usually served and even the smell of the beef cooking in the tomato. I also remember that as soon as it was served I would grab the bag of shredded cheese and add tons of it to my pasta; it would melt almost instantly. Now that I live in the United States, I transfer those memories to my kitchen where I'm the one in charge of preparing the dish. Using certain products helps speed up my process, like Progresso™ Fire Roasted Tomatoes for the sauce and wheat pasta.